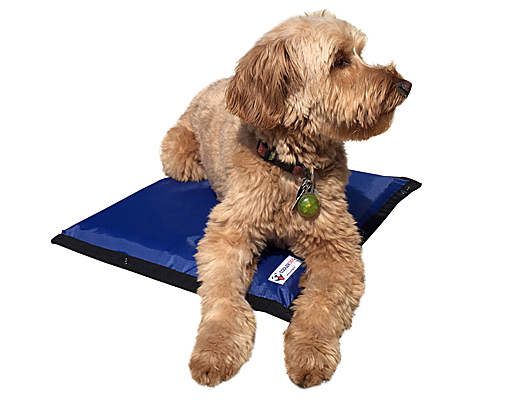 A gel pad layer that distributes the heat-absorbing power of the ice and provides a comfortable place for the dog. 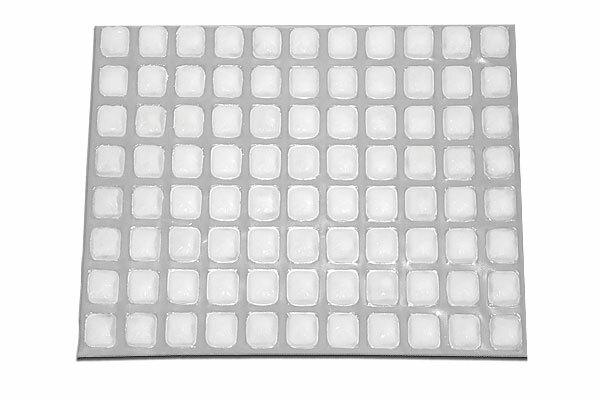 A FlexiFreeze® Ice Sheet that contains 88 built-in ice cubes (100% purified U.S.A. water, no chemicals) and absorbs excess heat from the gel pad and the dog while thawing, making it more effective than the gel pad alone. A 1/2" thick layer of closed-cell foam insulation that blocks heat from warming the mat from underneath. 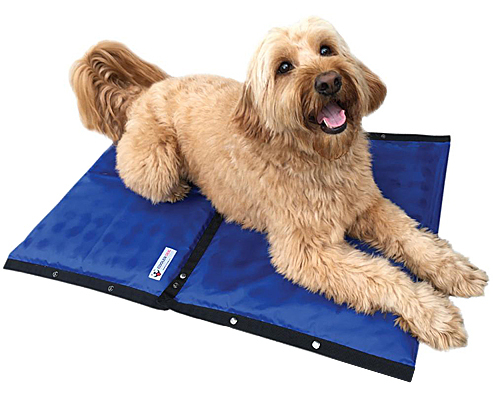 With snaps on three sides, multiple Turbo Cooling Mats can be combined to fit into different spaces to fit a wide variety of locations, and help cool dogs of all sizes. Durably constructed, the Turbo Cooling Mat can be used indoors or outside and is compatible with most crate sizes. Portable for use in cars, SUVs, RVs, dog trials, and on the go. And, since we all know that dogs can be messy, the Turbo Cooling Mat was designed to be completely machine washable. But what about when the ice melts? You can buy extra FlexiFreeze Ice Sheets and bring them with you in a cooler, but even if the ice melts you still have the gel mat layer which will continue to function as well as any gel mat on the market. 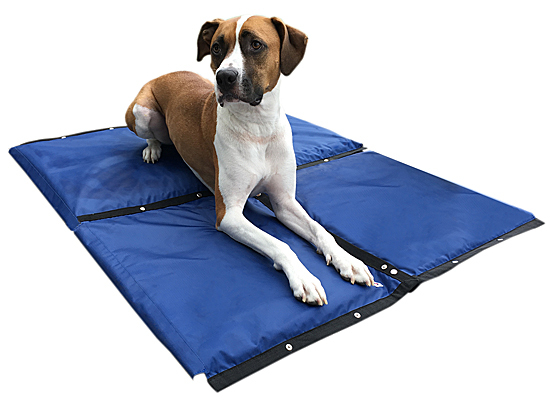 The current marketplace for canine cooling products is centered around two types of solutions: 1) evaporative vests and coats for active dogs and dogs at rest, and 2) gel pads for dogs at rest. Both of these product solutions feel cooler than their surrounding environment, but gel pads actually have minimal heat absorption capacity so they warm up fairly quickly. And, the effectiveness of evaporative cooling products is compromised in high humidity conditions; unfortunately, the vast majority of people in the U.S. live in high humidity areas. Drawing excess heat off of a dog's body core requires materials with high heat absorption capacity. Water, when frozen, has a high capactiy to absorb heat as it thaws. Cooler Dog products use water's phase change heat absorption capacity to draw excess heat from a dog's body core from underneath the dog where it's more effective. I bought two and used them all summer long in my dogs' crates. They worked great. I didn't have to worry about them getting too hot. The ice packs freeze overnight and last hours and once the mat themselves are cool, they stay cool even after the ice packs are no longer frozen. I highly recommend these. I'm looking forward to another summer of competing at dog shows and using these mats.